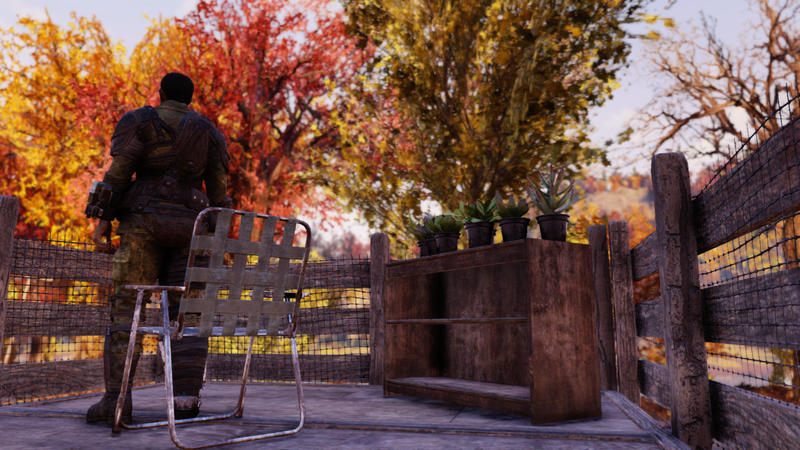 Bethesda’s open world MMO Fallout 76 is currently in beta on console and PC for those who pre-ordered the game. While you can’t spend actual money to purchase its in-game currency, called Atoms, players can now use the currency they’ve already collected from doing various in-game tasks to buy stuff from the shop’s initial offering. While pricing for Atoms hasn’t officially been revealed yet, Gamesradar spotted listings for the digital currency on GameStop’s Ireland website, with pricing starting at €5 for 500 Atoms. From there, you can get more Atoms for your money for buying in bulk (up to 5,000 for €40). And what will that cash get you? Based on what’s currently on offer in the Atom shop, not much. 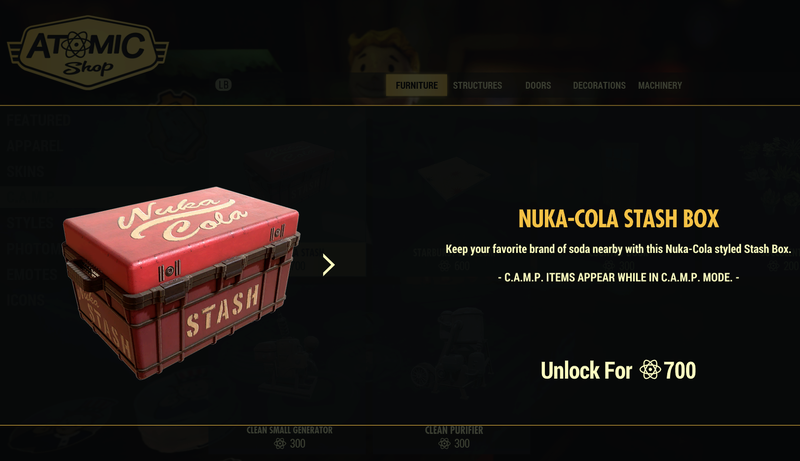 Currently, the most expensive item is a “Nuka Cola Stash” for 700 Atoms. At C.A.M.P. sites in the game, players can construct stash boxes to house their extra items and crafting materials. The Nuka Cola Stash is basically just a new skin for that original stash box, and a pricey one at that. It doesn’t change how much the box can store, only its appearance. 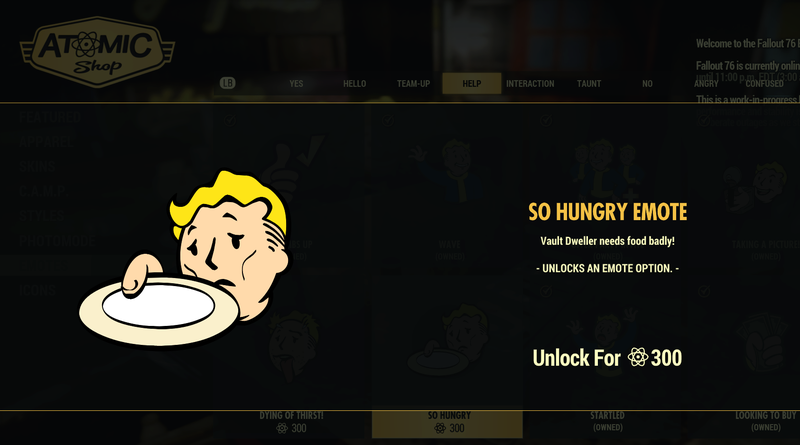 Other things you can currently buy in the shop include new emotes for telling other players you’re hungry or thirsty, as well as visual flourishes to add to your custom-created characters, such as stitch marks. Bethesda is even selling specialised frames for the game’s photo mode. Me (left) and my beautiful, hard-earned succulents (right). Again, you don’t necessarily have to spend real-world money to get this currency. The game awards you Atoms just for completing certain in-game activities, like crafting a gun for the first time or discovering a particular location. After about six hours of playing I had close to 500, and I decided to spend them on some succulents to see how the system worked. Like the other items in the shop, the decorative plants don’t bestow any material benefits in terms of gameplay. They just let me make my campsite a bit prettier. About 200 Atoms worth of prettier. Bethesda has said that Fallout 76’s updates will all be free, rather than paid DLC, so the Atom store will be the game’s main lifeblood post-launch. Whether the final lineup of items for sale there will feel worth the price to the average person, or only end up catering to die hard players who want the best-looking post-apocalyptic homes, remains to be seen. The game launches for real in two weeks on November 14.